It is said that during the early days of the American Revolutionary War, the British had little trouble tracking the movements of the American Continental Army, they needed only to follow the bloody footprints left in the snow by the underequipped soldiers, many of whom didn’t even have shoes to wear. When the Continental Army marched into Valley Forge in the winter of 1777, they were naked, starving, and dying. Before the end of the winter, more than 2500 had died from disease and malnourishment. Yet, through determination, hard-toil, and sacrifice, and through the sheer force-of-will of their Commanders, the Continentals emerged in the spring of 1778 as a well-equipped, highly trained and disciplined fighting force able to stand toe-to-toe with the most powerful military on the planet. Their steadfast perseverance during the brutal winter forever bonded them as an army which created a nation, and all Americans are forever in their debt. To me, and others, Valley Forge is a holy place, and someone more poetic than I will have pointed out that it is fitting that the encampment in which the Army spent the winter was named after a nearby forge, because the army, and perhaps the nation itself, was forged there as well. 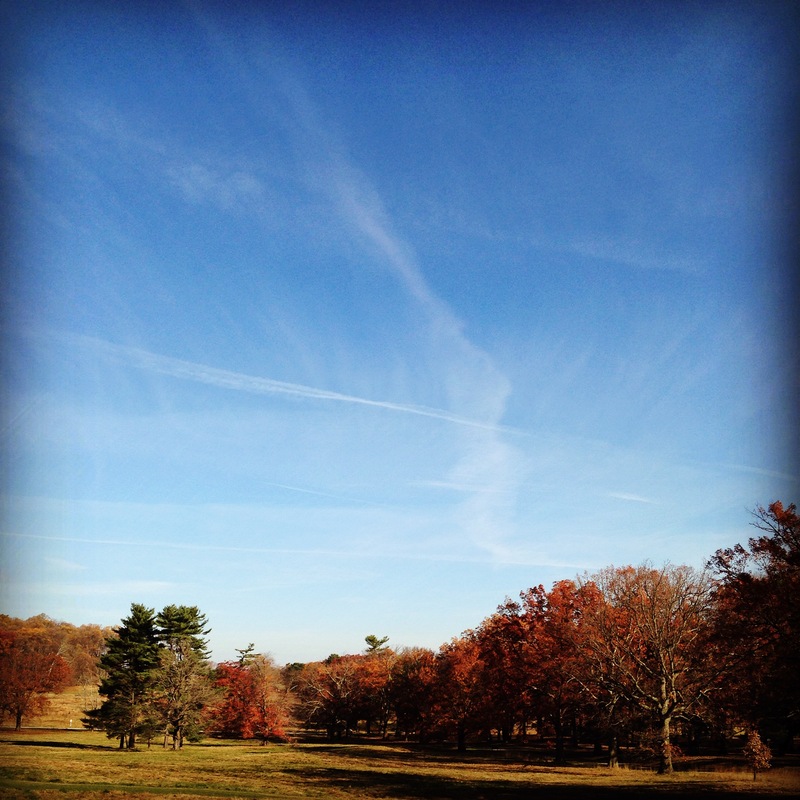 Though it was once a place of hardship and sacrifice, it is now a beautiful, serene park. But the spirit of sacrifice, and volunteerism, and the United States of America itself is still there, in the paths, and fields, monuments, and log huts that dot the landscape. On Saturday morning it was once again my honor and privilege to spend the morning at Valley Forge Park doing my part to help keep the park beautiful. Though I cannot claim that my own minor contributions were anything worthy of remembrance, I am nonetheless overwhelmingly proud to offer my services, however inconsequential they may be. The sacrifices made by the Continental Army are beyond the comprehension of most people, including myself. I am only trying to keep in my heart the spirit of the volunteer, the person who gives up a bit of his or her free time in an attempt to make the Country, or the world, a little better place. Yesterday morning much was accomplished in a brief amount of time. We had a nice sized group of volunteers, all ready and willing to put in a morning of hard work. The weather once again cooperated, allowing us to accomplish several different tasks simultaneously. 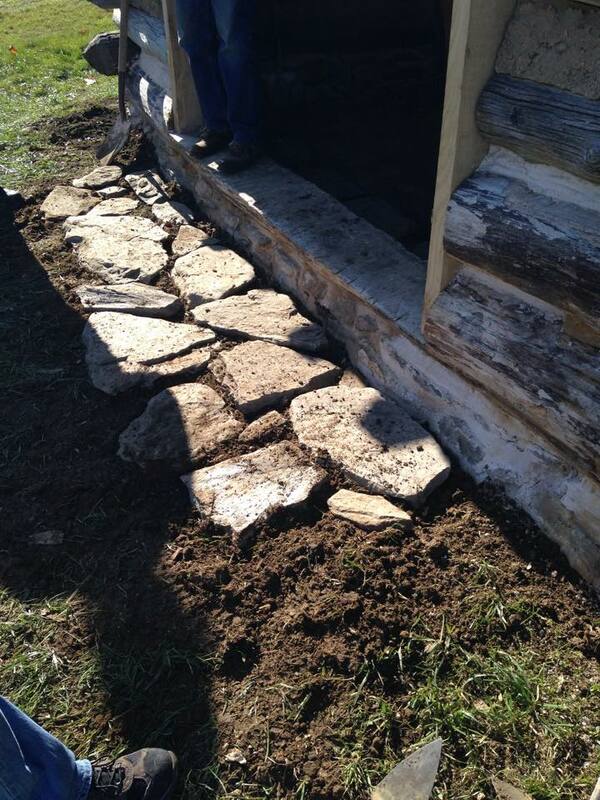 First thing to do was dig out and level the ground both inside and outside the back entrance of the Blacksmith Hut in order to set stones as an entryway. When that was finished and the stones were set we filled the gaps tightly with the first layer of black sand. 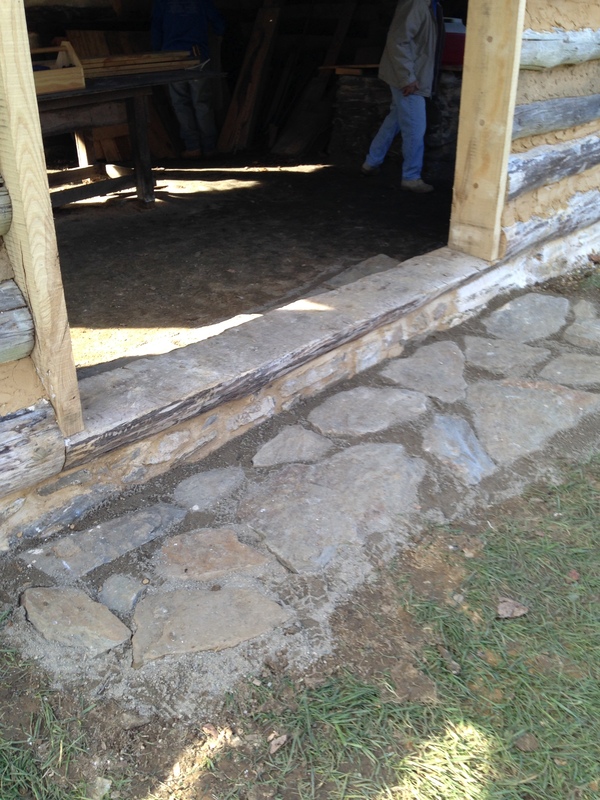 Later, the park service will level the interior of the hut and lay down a thick layer of new gravel. 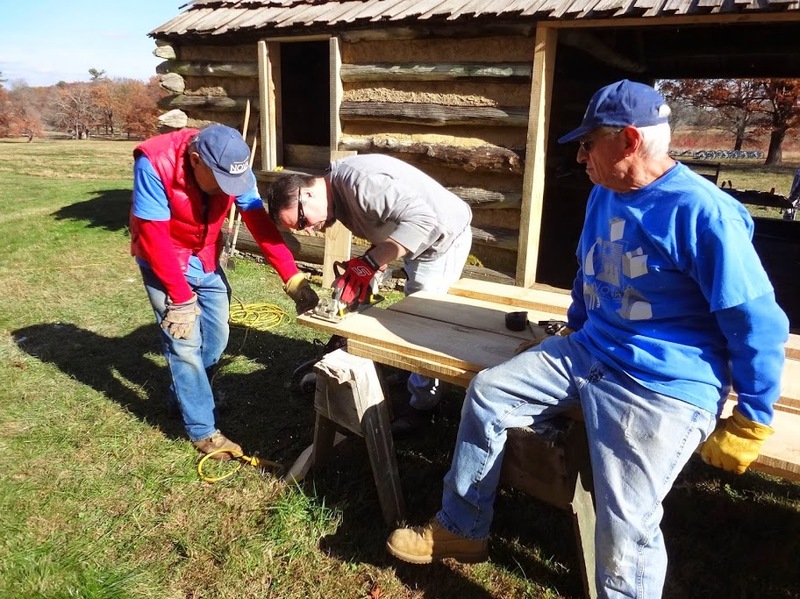 Once that was finished, we split into two groups, one group to continue the daubing and chinking of the gaps between the logs both inside and outside the hut, and one group to start making the shutters. I was with the shutter group. Stones leveled, with first layer of sand added. 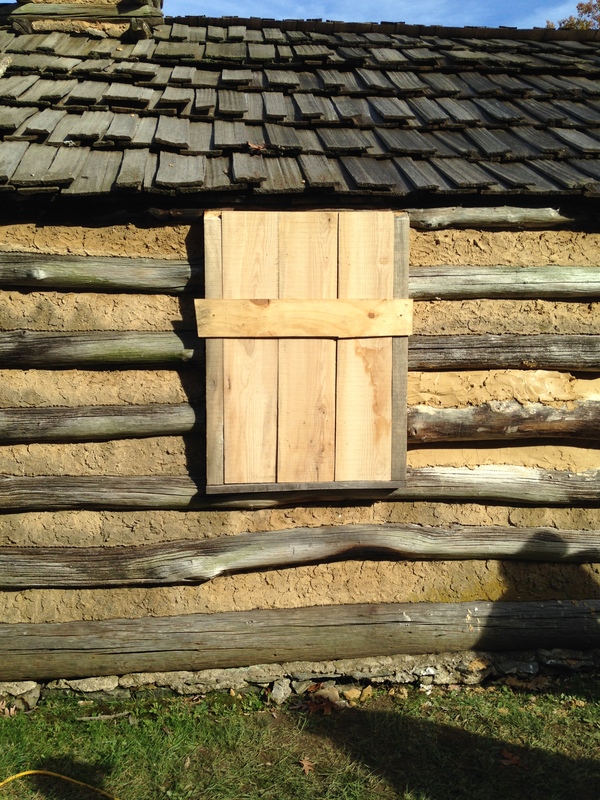 Making a shutter to precisely fit in a 75 year old cabin window can be tricky. We took some rough measurements, but I knew that it was going to be a lot of trial and error. Though the park service provides all the tools we need, I decided to bring my home made jointer plane, a block plane, a few hand saws, and a marking gauge. The wood we used was rough hewn white oak. 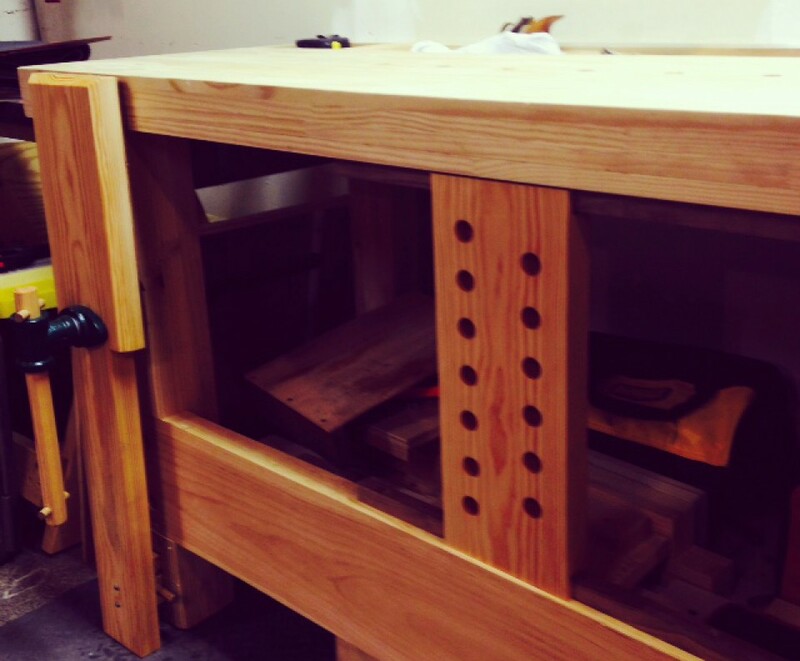 Though the park service has a woodshop equipped with a planer, the rough hewn look was chosen to be more authentic. After cutting the boards to equal, but oversize length, we did a test fit and marked the cuts. I ripped each size to rough width with a skilsaw, then used the plane to achieve a final fit. 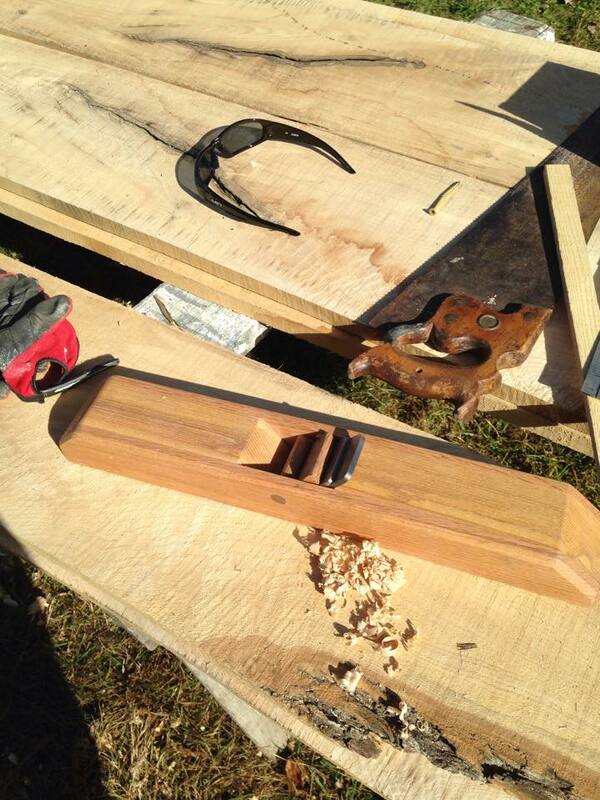 I’m very happy to say that my home made plane performed beautifully, and ribbons of white oak were thrown all over the job site, and it seemed appropriate to be using the tool considering the circumstances. We were able to get a very respectable fit in a window opening that was hardly square. The boards were sawn to final length with a hand saw, and temporarily set in place. Shutter nearly fit and temporarily in place. We then started on the cross battens, but at that point the job was winding down and the morning over. The park ranger supplied us with a jug full of blacksmith made cut nails which would be used to clinch fit the battens to the shutters by nailing them through with a steel plate on the other side, same as would have been done 200 years ago. Unfortunately that will have to wait until next session. More good news came after I had a brief talk with the ranger. The blacksmith hut contains an old work bench which unfortunately had its base damaged in a flood. However, the top, which is nearly 4 inch thick oak, is still in good shape. 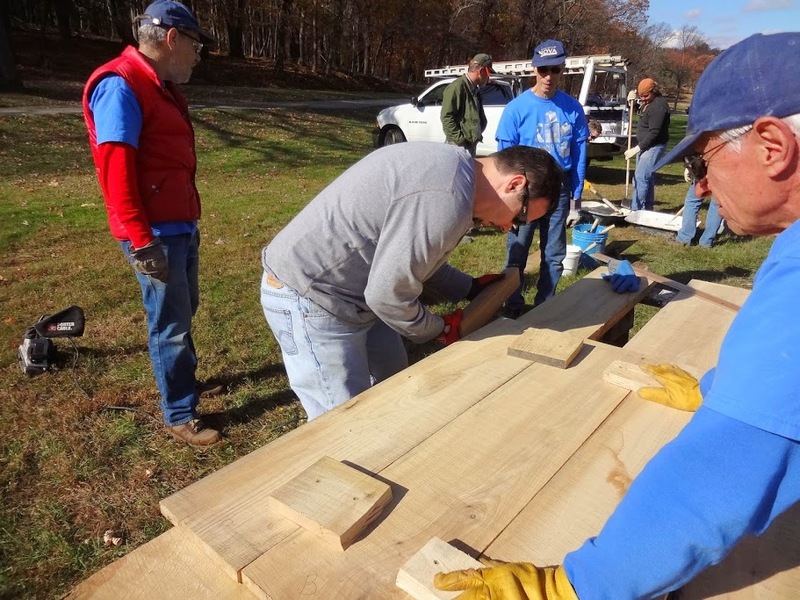 The ranger said that if I would like to rebuild the bench it shouldn’t be a problem, and I’m sure that I would have lots of help from the group. I was thinking of a traditional English joiners bench, though that may not be appropriate for a blacksmith shop, it would probably be appropriate for the colonial era. All in all, we accomplished a great deal, worked hard, had fun, and hopefully did some good. I couldn’t be more proud of the efforts of all involved. 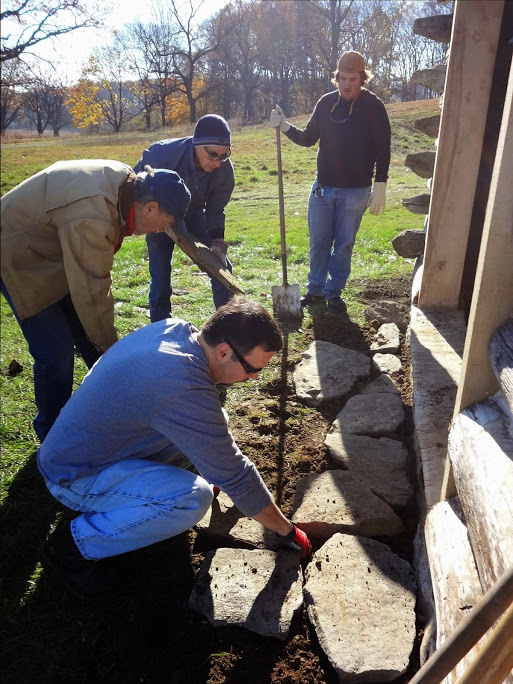 So I ask once again, if you would like to make a donation to a very worthy cause, please consider the Friends of Valley Forge, an organization of volunteers that works directly with the park in keeping it a place a history and beauty. 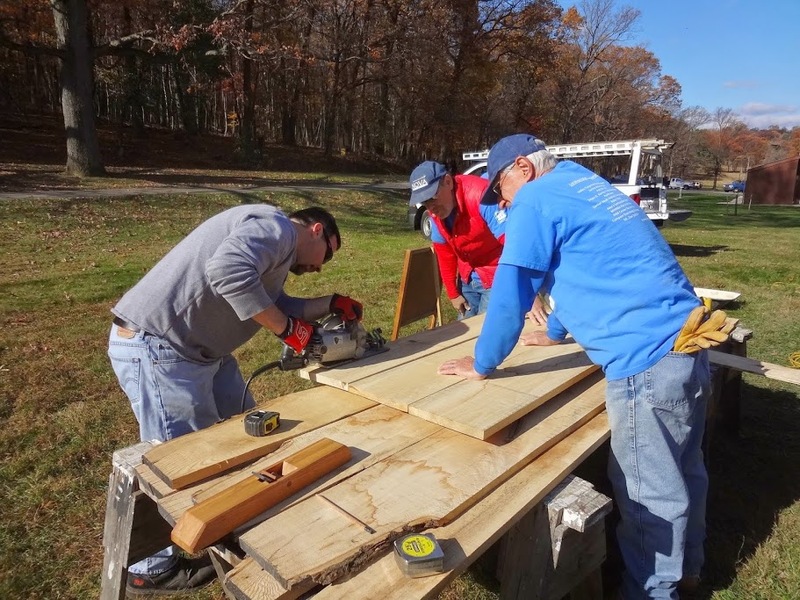 Better yet, if you live in the south eastern section of Pennsylvania and you would like to donate your time, please consider Valley Forge Park as a place to volunteer. If not, maybe consider volunteering at a local park in your home town. I write this post not for my own benefit, nor to tell everybody that I am deep down a great guy, but because being a volunteer is one of my proudest accomplishments, and I like to think, I hope to think, that if an admitted cynic like myself can find so much good and happiness in spending a few hours per month offering my miniscule services, then maybe a lot of other people could too.